Light Steel Framing Members 3D has been redesigned to make it quicker and easier to add your Light Steel Framing to your 3D model simple by selecting multiple 3D line for extruding the steel framing on. 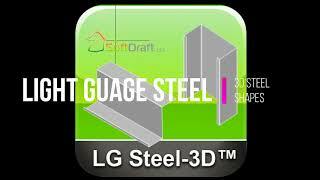 First add the 3D lines for your steel framing model then open the dialog to select the steel framing type. Once selected click OK to select multiple lines for 3D extrusion of the shape. Check the "Rotate Each" to rotate each shape after it is extruded for corect rotation. B Flange: widths 1.25" to 3.5"
D Web: depths 2.5" to 14"
H Leg: 0.188" to 3"
T Gage: thickness 0.188" to 0.135"
L Return: leg 0.25" to 1".